Todays daily painting theme for the daily painters is out of the box. The ideat is to push you to do something that you normally do not do. I have been wanting to paint waves and the ocean so I decided to give it a try. Next month on the first Wednesday of the month. This is the third painting in my self portrait series. I plan on painting one self portrait a month. I picked up this leaf on my moring run. It was so large I thought it would make an interesting still life. Sources give different information for the time and place of the pretzel's origin. The History of Science and Technology, by Bryan Bunch and Alexander Hellemans, claims that in 610 A.D. "...an Italian monk invents pretzels as a reward to children who learn their prayers. Flavor/Aroma: Sweet aroma and nutty flavorAppearance: Possibly the tiniest of the seeds; round and blue-gray in color Pairs Well With Spring Foods Like: Baked goods, citrus, salads and salad dressings, stir-friesPoppy Seed is used topically on breads and rolls, and added to vegetables and salad dressings. Turkish cuisine uses toasted Poppy Seeds, while Indian and Turkish spice blends rely on crushed Poppy Seeds for flavor and texture. The Pansy, it would seem, is one of the most alluring of all garden flowers. Its little faces make most of us laugh when we look at them. The English have given the Pansy many nicknames, such as Call-meto-you, Love-true, Three-faces-under-a-hood, Pink-eyed-John, Tickle-my-fancy, Bird's-eye, Jump-up-and-kiss-me, God-father, Godmother, Love-in-idleness, Kiss-me-in-the-buttery, Rob-run-the-street, and Heartsease. With such names, it is not strange that the French call it pensee, for this word means thoughts. Yet with all the Pansies' charms, there are some persons who do not grow them. I love the little charmers. This is number 2 that I have painted the other was over a year ago but its spring and I see them everywhere, so I must paint them. The shell of a turtle or tortoise is made up of about 50 bones that are all connected together. This tissue is very much alive, not like dead tissue found in hair or finger nails. Tortoises also have the ability to store sperm, sometimes producing fertile eggs three years after their last mating. There was a pelican out in the bay in front of my studio just taking a nap on a post so I had to paint one. Flamingos feed on brine shrimp. Their oddly-shaped beaks are specially adapted to separate mud and silt from the food they eat, and are uniquely used upside-down. The flamingo's characteristic pink colouring is caused by the Beta carotene in their diet. The source of this varies by species, but shrimp and blue-green algae are common sources; zoo-fed flamingos may be given food with the additive canthaxanthin, which is often also given to farmed salmon. Flamingos produce a "milk" like pigeon milk due to the action of a hormone called prolactin (see Columbidae). It contains more fat and less protein than the latter does, and it is produced in glands lining the whole of the upper digestive tract, not just the crop. Both parents nurse their chick, and young flamingos feed on this milk, which also contains red and white blood cells, for about two months until their bills are developed enough to filter feed. Early Spring Crocus poke their colorful heads out of snow to tell us spring is almost here. I am in Florida right now and I miss the little green sprots and brilliant color that welcome spring. They are brave to bloom in the crisp snow with their paper thin bloosoms. T'was the eve of St Patricks Day and this little pig found a tastie shamrock to munch on. A little bit of Saint Patrick in this puppy. A green dog, next time I will do a yellow dog. Herons are wading birds that have the most interesting long legs. I have painted small versions of this whimsical guy before. Artist create fantasy to capture your imaginations. Some days you just need to have fun with your art. Isn't play what art is about? About This Painting:Chip the dog of a different color. It is interesting to see how Chip changes as his color changes. A friend sent me a picture of their dog chip. I thought it would be fun to paint Chip in different colors. So the first one is in Red. We will see how Chip fares as he changes colors. About This Painting: Florida has so much wet lands this kind of a landscape is easy to find to paint. 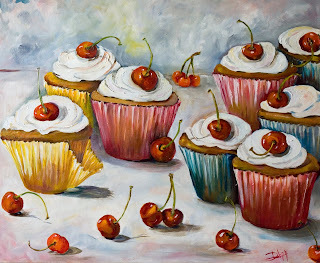 About This Painting: This large oil painting of cupcakes oil painting with cherries is for sale. It took several weeks to complete and is not a daily painting but one of the paintings of the day to view. Oil painting of sail boats at sea. Tall sails and calm waters. I had so much fun painting this it was a pure joy to do. This is a virtal painting that I have done of a park in Seatle. To gather in one area of the world, virtually, once a month with other artists.To paint or draw a scene and composition of your choosing, within a predetermined area.You may put as many hours into the painting as you wish. You've got a month! About This Painting: A daily painting of a few things I found around the house are todays painting. Have you ever wonder what it is your cat is looking at as it follow some invisible thing in the air? Next time look at the reflection in its eyes and maybe you will be lucky enough to see the fairy.